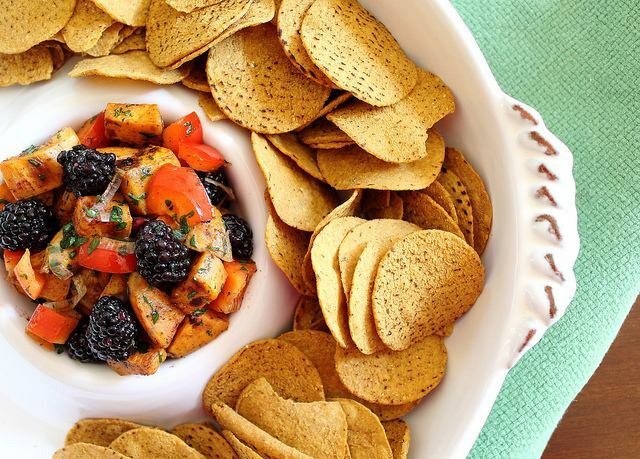 This sweet potato salsa is made with blackberries and pomegranates. The best of summer and winter in this versatile salsa. Salsa in the middle of winter? You can thank Mexican blackberries for $1.99/1.5 lbs. and my husband’s idea to therefore buy two packages of them for this recipe. There’s only so many berries one can eat in their breakfast. The blackberries aren’t actually the focus of this salsa though, it’s all about the sweet potato. Specifically, those sweet potato chips from Trader Joe’s. They may have been the inspiration for this as I mind numbingly ate one chip after the next straight from the bag. So good. Craving a salsa in the middle of winter is kind of tough when tomatoes generally taste like chalk and most of your typical salsa add ins are way too pricey. So, I compromised. Roasted sweet potatoes with cinnamon for the winter element with pomegranate and blackberries for the sweet, fruity, tangy part you’d normally get in a summer salsa. 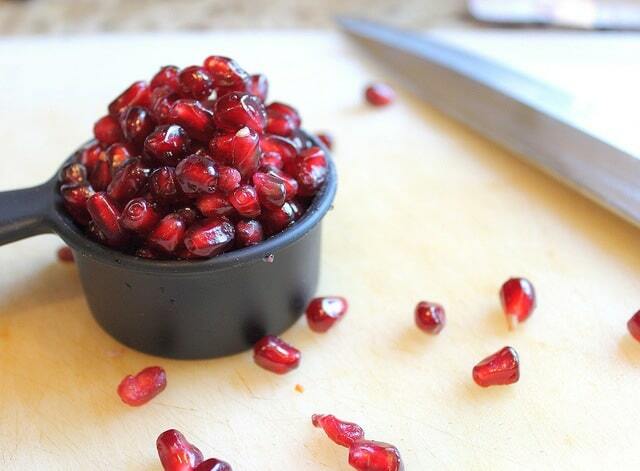 These are the pomegranates that wouldn’t go away. This is the last of the arils from when I made these almost a month ago. I was getting incredibly sick of seeing that tupperware container in the fridge. The best part about this salsa is that it’s light enough to eat on chips as a snack, but also hearty enough to serve as a side for dinner. I ate it both ways. In the same day. Now I just need to figure out a way to use up the remaining 2.5 lbs. of blackberries. Strawberries and blueberries were also on sale. We have 7 different containers of berries in our fridge right now. H.e.l.p. Toss potatoes, olive oil, cinnamon, nutmeg and a generous amount of salt & pepper together in a large bowl. Spread the potatoes out onto the baking sheet and roast for 10 minutes. After 10 minutes, flip potatoes and add sliced shallots to the pan. Roast another 10-12 minutes. While potatoes and shallots are roasting, whisk together grapeseed oil, vinegar, honey and a dash of salt & pepper in a small bowl, set aside. When potatoes & shallots are done, transfer to a large bowl. Add red pepper, pomegranate, blackberries and parsley and toss together gently. Pour dressing into bowl and toss again. YUM! what a great spin on salsa — by the way, your photography is getting better and better, i love it :) good job on that!! I’m all about having somesummer foods in the middle of winter! Any suggestions on what to substitute the pom arils for if I don’t have those? This looks so delicious – damn TJ’s for having such delicious chips. Those sweet potato chips are dangerous. I can hardly keep them in my house without going ape on them. Your photos are beautiful – especially that 2nd to last one with the two chips and the berry in the center. This recipe is my kind of food. I love the combination of the sweet potatoes and blackberries. And having too many berries in the fridge is not a bad problem to have! OMG this is genius. I bow down to you. I need some of that right now. Too bad all I have is clementines. gorgeous. I love sweet potatoes with ANYTHING, so carbs with carbs? I’m in. 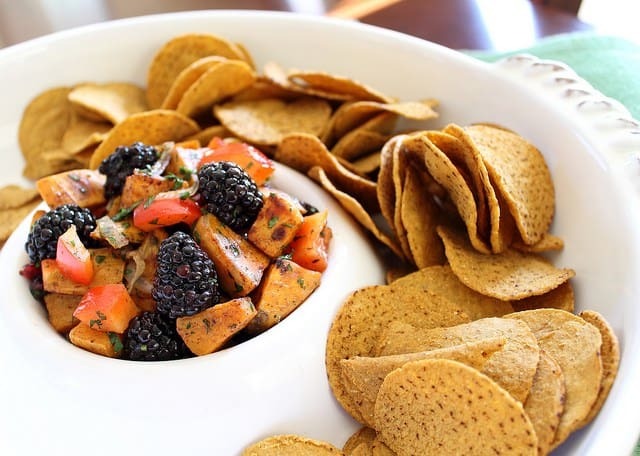 Sweet potatoes and blackberries together? Brilliant. I’m going to say freeze the berries and make smoothies with them when you’re no longer sick of them. Or make jam. SO pretty!! And your photos are POPPING!! Oh my goodness, that salsa has all of the best things in it! You are genius! this is such a cool idea! I love that you mixed sweet potato with blackberries and pomegrante seeds..that sounds amazing! That recipe sounds awesome! Aside from sounding great, its such a pretty dish. I love all of the colors! omg your resizing and file saving your photos differently is never more evident than in this post. Your pics went fro 0 to 60mpg like…overnight. Omg. Gorgeous. and I can really SEE the details in the food. I would give anything for 7 berries in my fridge. Beautiful photos! 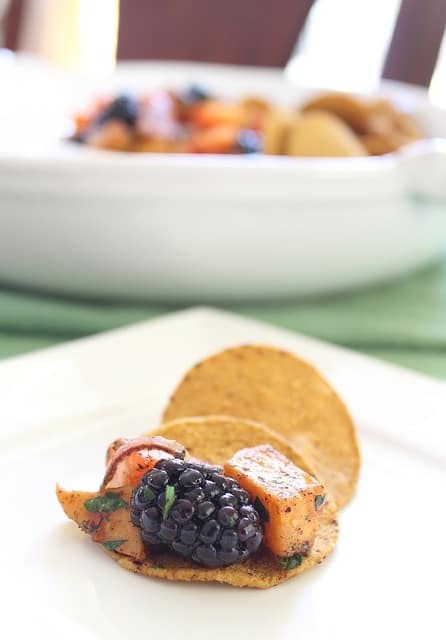 I love the idea of sweet potatoes / blackberries together! Blackberries are really cheap here too- are they a winter fruit? I never see them so abundantly in summer! How creative! 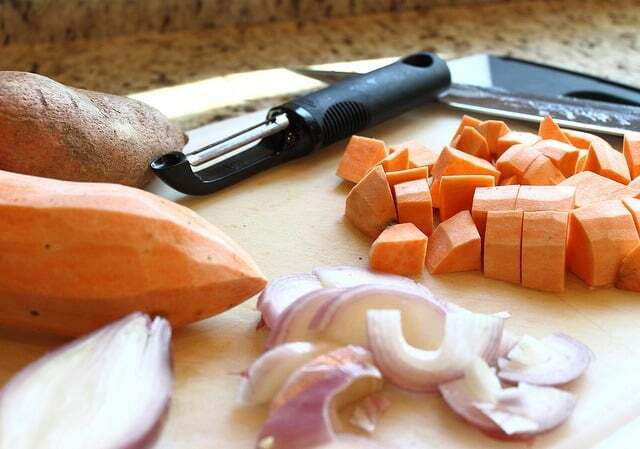 I would never of thought of a sweet potato salsa! Sounds perfect!! This is brilliant! The combination of flavors sounds phenomenal.